Here is the scenario for Ligny as we used it; it was shamelessly stolen adapted from that by my e-freind, Michael (aka Wargamer Rabbit). The main changes were to simplify the map, eliminate all but Jeanin's Division of Lobau's Corps (as it doesn't appear to me that the rest of the 6th Corps fought at Ligny), and to move most of the Prussian troops onto he actual table at the start of the game... and of course adapt it to the Field of Battle rules. 1) Change The Ligny to a Class III stream, with normal FoB rules. This is quite bad enough! 2) Downgrade the Prussian Infantry to be DD 6, CD 10 for all "Line"/"Reserve" regiments", and DD4 CD8 for all Landwehr regiments. 3) "His presence on the battlefield is worth 40,00 Men!" Add an extra 12 Morale points to the French total as otherwise determined by the normal Field of Battle rules. They are going to need them! Should Napoleon be lost, well the game is effectively lost anyway, but so are the bonus Morale Points. The Battle of Ligny is much less well known (to English speakers, at least) than Waterloo or Quatre Bras. Playing the games gave me a greatly improved understanding of the battle, as well as an appreciation for how well the French fought this day in order to inflict a significant (but not decisive) defeat upon the Prussians. One can only imagine what might have happened had all of D'Erlon's Corps arrived as expected, and had he notified Napoleon properly of his approach to the area! 1" = 50 yards. Rules: Field of Battle, 2nd Edition, by Brent Oman (Piquet, Inc). Built Up Areas (BUA’s) represent the gardens, low walls, outhouses, narrow lanes etc. of these villages. Infantry positioned in the green zone BUA’s are treated as though in light woods (Class II) for visibility, movement and combat modifiers. The actual building placed within the BUA are still class II or III positions. Buildings are class II except for one. En-Haut farm located in Ligny, shown on map with a Cross, is class III. En-Haut is representative of several buildings in Ligny, which were solid strong points. Ligny stream has special crossing rules. It counts as Class II Terrian, with an additional movement cost of 2” for infantry (4” for cavalry), and causes any unit crossing the stream to become Out of Command until rallied, and prevents charge movement (engaging in Melee on a won Even roll, or a melee card, unless already in contact). Bridges nullify the above special movement rules. Artillery must remain limbered on MOVE they cross the stream, is out of Command and costs 2” of movement. Possible rainfall from the turning of the 5th French MOVE card onwards. Roll a D6; on a score of "6", a rainstorm (with lighting) occurs. Add one to the D6 roll for each MOVE card turned by either side thereafter until the rain event occurs. The Rain lasts for that MOVE card and the following MOVE card (of either side) , and ends when the 2nd MOVE card (of either side) is turned following the one that triggered the downpour. During the Rainfall artillery is DOWN 1 additional for fire, and Infantry is DOWN 2 for fire combat. Prussians must hold the villages: The Prussian army must attempt to contest three (3) of the five (5) following villages. Contesting means occupying one or more buildings in each village. The five (5) villages are; Ligny, St. Amand, St. Armand la Haye, Wagnelee, and the group of Tongrinelle, Baignee and Balatre together. Failure to contest at least three (above list) causes Prussians to lose D8 Morale Points when each Prussian MOVE card is turned until the requirement is fulfilled again. French Village Tactics: While positioned in the outlined BUA’s (green zones), a French infantry unit is UP 1 for both morale and melee combat while in the BUA zone itself. This French bonus is not applied to units in buildings (normal rules apply). Franco-Prussian hatred: Any melee combat in the BUA zone, or buildings in the BUA, automatically gives the losing (retiring) side additional UI loss. This additional UI loss does not cost a Morale Point, nor count towards causing a Routed/Destroyed result. French have reinforcements marching to the battle. Jeanin's Division of Lobau’s 6th Corps will arrive starting with the First French MOVE Card. 6:00 pm hour turn. They march onto the table in March columns along and within 12” of the Fleurus road at the Southern table edge. D’Erlon’s 1st Corps will be “seen” starting with the Third French MOVE card. Once seen, the Prussian commander may invoke a special “dark masses” condition at the start of the 3rd, 4th OR 5th French MOVE Card. From them until the next French MOVE card, the Imperial Guard and Milhaud's Cavalry Division may not cross the far side of the Ligny stream, or if they have crossed, may not advance further until the next French MOVE card is turned. D’Erlon’s detached 4th Infantry Division and 1st Cavalry Division will actually enter the table at the start of the 5th French MOVE card. They enter Deployed along the Northern 3 feet of the far Western table edge opposite Wagnelee, etc. The Prussian Cavalry of the 2nd corps starts just off the table as shown, and may enter the playing area adjacent on any Prussian MOVE card. The game ends after the 7th French MOVE card is played and acted upon (Move One Command Cards are ignored when counting MOVE cards for any reason). Darkness has fallen, ending the fighting. French Crushing victory: The Prussian army is driven from all the named villages and has failed Army Morale by nightfall. Hung Battle (draw for today): Prussian Army is still contesting two or more named villages. Neither side has failed Army Morale. Battle will either continue next day or Blucher and Wellington make other plans. Prussian Minor victory: Be contesting all the named villages at nightfall, and/or French fail Army Morale. Prussian Major victory: Cause the French to Fail Army Morale and have Prussian infantry units within 12” of the exit road to Fleurus. Napoleon soon signs his second abdication. The Hundred Days is over. 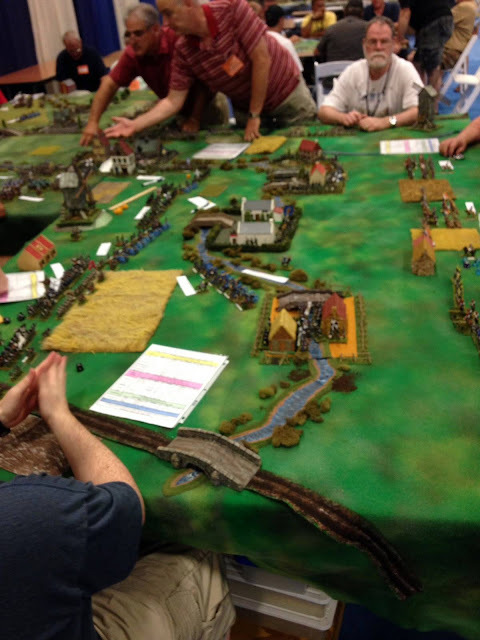 I ran the Ligny scenario (to be posted soon) twice at Historicon, once at 7 PM on Thursday evening, and again at 9 AM Friday. It was a good thing that I started it as late as I did, and that the large, "L" shaped table (essentially, two 6 x 10 foot tables side by side and overlapping 6 feet on the sides) was available early, as it took me nearly 6 hours to set up all the troops and terrain. The Prussian troop mix in particular was such that it would have been difficult for anyone to assist with setting them up, although I did have some help doing the much more straightforward Frenchmen! In any event, I was very happy with the final appearance of the table. Unfortunately, I couldn't find my camera, and although I was sure that I had packed it, was forced to conclude that somehow it had been left behind at the last moment. Therefore, I took NO pictures at Historicon this year (I had my cell phone camera, but the pictures from that are so awful for this kind of thing that it isn';t worth taking them). That's ;part of why this post isn't up until well after the fact. The photos here are courtesy of Tim's Blog, Victor's blog, and the indispensable Czar Barry. Thanks, guys! Of course, when I got home, I discovered that I had the camera with me all along - just buried at the bottom of my bad, where I had in fact placed it first thing to be SURE I wouldn't forget it. Duh!!!! Overview of the Table nearing completion of the setup Thursday night (and of Peter fretting over some issue with the OOB). From left to right, the villages along the heavily overgrown Ligny stream are: Wagnelee, St Armand la Haye, St Armand, Ligny (near the junction of the two tables), and far off are Tongrinelle, Baignee, and finally Balatre. This shot shows the view from the opposite direction, once again with Ligny in the center, and now with St Armand, etc in the distance. The Thursday night game started with the Prussians wining the impetus roll by 6, and deciding to give the first run to the French, fearing that they'd waste good cards (especially the Infantry Firepower card) while the French were too far away for them to use them. As is often the case when one makes this bet, the French then proceeded to turn almost a perfect run of Cards - Artillery Firepower, Move, Infantry Firepower, Artillery Firepower, Move, Melee. Above Jim Mauro, assisted by Dr Tim, attacks Ligny. The MOVE cards allow the French Reserves to enter as well... Old Guard and the Cuirassiers! The Prussians got well and truly pounded by this superb card sequence, and were nearly ejected from Wagnelee, St Arman la Haye, and St Armand, and were pushed back in Ligny. We had a full slate of 12 players, but almost half were new to the Field of Battle rules. If I had thought about it, I would have made sure that veteran players were opposite newbies wherever possible so that they could assist them at learning the rules. Naturally, the Prussian players started to loose heart after the string of French successes, despite the fact that they had tons of un-engaged troops in reserve, and their Morale Point reserve was huge. Of course, the thing about a big run of cards in Field of Battle is that an equally long run of cards is going to come to the other side, so as long as you haven't been crushed yet, you'll have your turn. That is of course what happened, and on their run of cards, the Prussians hammered the French, and they lost virtually all of their gains in the villages... and a huge amount of Morale points as a result. The French forces were rather thin opposite the Wagnlee - St Armand leg of the Ligny, and when the next French run of cards proved less than spectacular, the Prussians used their cards to counterattack and severely maul their opposing numbers. Despite the fact that it was only about 10PM, a number of the players were tired and drifted off, so we ended the game then. The French were unable to make any further headway around the villages, and were down about 35 Morale points to the Prussians. Had play continued, a very convincing French defeat was virtually assured! We used the time to reset most of the troops for the Thursday AM game, and finished the process starting about 8 AM that day. Here's a shot of the French Right , with Ligny in the background. Soldier's eye view of St Armand La Haye, with the Bussy windmill in the background, as the French prepare to attack. Terry's Prussian brigade prepares to advance from its reserve position to threaten the weak French flank near Wagnelee. The initial French assault on Ligny was repulsed with heavy losses, but once again they achieved initial major successes at Wagnlee, St Armand La Haye, and St. Armand. La Garde arrives, along with the Cuirassier Divisions. The French have a decided advantage in the numbers and quality of their cavalry, but the nature of the battlefield makes it very difficult to put it to use! The Prussians, however, have far more infantry, and no lack of places for them to hole up! The Imperial Guard Artillery is moving up to a position so that they can shell either Ligny and/or St Armand. Tim, a renowned beau-sabre, looks for the cards to get his Prussian cavalry across the steep banked Ligny stream to threaten the battered French near Ligny itself. For the Thursday AM game, we had only 8 players so we left off the other leg of the table. Almost all the players for this game were FoB veterans, so things went far more smoothly. The fighting in and around the villages was vicious! And they do eventually come! Here Tim's Dragoons, Hussars, and Landwehr cavalry have forded the treacherous Ligny stream forcing Phil's French infantry to form square. Phil had rolled several "1's" on his Move cards, and thus the French assault on Ligny went nowhere fast. Overview looking towards St Armand. The Young Guard is preparing to assault St. Armand, the Guard cavalry is heading up the road to counterbalance times troopers, and Sam is sending his Cuirassier Divisions to the French Left to intimidate Terry's Prussians, who have recaptured Wagnelee and St Armand La Haye, and have boldly advanced across the Ligny, threatening to mop up what remained of the French attackers there. Having re-taken the lost ground in the villages, the Prussians are sending heavy reinforcements to support St Armand, which is threatened by the Young Guard. Poor Bill (grey sleeve) needed a little professional advise about the sudden development of some nasty GI symptoms he was experiencing, but he boldly soldiered on (and felt progressively better as the game progressed). The Prussian Artillery is being used very effectively to pound the exposed French. Once again the French Morale pool was being rapidly exhausted, while the Prussians maintained and expanded their starting lead in that critical area. A major Prussian victory seemed likely in the offing once again when we had to halt play to set up for the Die Fighting 2 game that followed. Overall, I found myself impressed that historically, the French managed to pull off a fairly convincing victory over Blucher's Prussians, given the strength of their position, and their decided advantage in numbers. I'll have some thoughts about that when I present the scenario itself. As I finished work on my scenario for Ligny, it became apparent that I would need more bridges... a LOT more bridges, in fact. Not only that, but I had a mere six days to come up with them. A quick email to Czar Barry revealed that I could tap him for at least 2 bridges, and I had about 5-6 of my own existing. Thus, another SIX bridges were needed. Yikes! Fortunately, my recent Windmill building activities had left me with plenty of raw materials. I also had this old bridge armature made from artist's board and a few pieces of Balsa wood, left over from the last time I scratch built some bridges about 20 years ago. Two pieces of square balsa wood were used as the bridge supports at either end of a sheet of balsa. The floor of the bridge was glued to the supports, and for extra strength, "nailed" to the supports with pins. The up-sloping sections were than glued and pins to the other half of the supports, and the sides glued on. The construction thus far was brushed with a thinned coat of white (PVA) glue, and allowed to dry; the sides were then cut and glued to the "ramp" ends of the bridges. Another coat of thinned PVA glue was applied and allowed to dry (a nice, warm sunny day helped a lot there!). and then transversely to the floor of the bridges. As the bridges were to be used for Ligny, I wanted at least one of them to be made of stone and whitewashed, as many of the area buildings were. I made that bridge with thicker sides, and used an old hobby product, "Squadron Green Putty", to fill the cracks in the side walls. Everything was brushed yet again with another coat of thinned PVA glue, but in the case of the "stone" bridge, I added a generous portion of the scenic sand I used for my Egyptian bases to the glue. They were then allowed to "bake" ion the sun again for a few hours so that they would dry thoroughly. That left them alongside our hydroponic Tower Garden (above), planted with cucumbers, zucchini, lettuce, kale, cilantro, and cherry tomatoes. Once they were dry, I primed them with black spray primer (white for the "stone" bridge). The next evening (the Monday before Historicon). I spray painted them all black, top side and bottom (again, white for the "stone" bridge), using the $1.99 Wally-Mart spray paint. At that point I was out of time, and packed them up for the trip to Fredericksburg.... along with a large nylon brush and 4 colors of craft paints! Bridge #1 - the narrow craft sticks were used for the planks on this one. As I was due to arrive in Fredericksburg several hours before Tim would fly in from Scotland (by way of Ireland), I figured I would dry brush the bridges in my hotel room while I was waiting for him, thus continuing a long tradition of my doing last minute work for my games at the site! Unfortunately, there was a bit of a SNAFU with the room reservation, so I wasn't able to get into the room until after Tim arrived at about 6 PM, and we'd have to change rooms the following day for the rest of our stay. Bridge #2 - same planking, different paint colors used. So, I dug out the bridges, paint, brushes, and palette from my tightly packed up car. I didn't really want to be painting in the lobby and risk getting paint on the furniture. Bridge #3 - the wider, thin balsa strips were used for the planking here. So, I decided to do the painting in the warm afternoon Virginia sun out there in the parking lot! Side view of Bridge #3 - I like this mix of colors best. This wide bridge used the old armature. I got a few amused looks but that was about it. At this point in my life, I could really care less; look, if push comes to shove, I'm probably far more successful by conventional standards than most of them are anyway! Bridge #4 - the sand and glue mix really worked great for the "stucco effect". Hard to see where that green putty was applied now, isn't it? When I got home after Historicon, all the bridges got a coat of flat acrylic varnish, a coat of Magic Wash, followed by a second coat of the acrylic flat varnish. It did the most good on this bridge, although that's hard to discern in this photo. Bridge #5; narrow but using the balsa as planking. This wood seems to take the dry brushing better. Between the temperature in the 80's, bright sun, and mercifully low humidity, it was quite "dry" brushing; I had to go into the bathroom off the lobby several times to wash out the brush! It took me about 90 minutes to do the six bridges, each with 2 consecutive courses of dry brushing. Bridge #6 - back to the craft stick planking. At that point, Tim was getting to be a bit late, and I was getting hot out in the parking lot, so I went into the lobby, linked into my office remotely, and started handling prescription refills and other routine tasks. Shortly after 6 PM, Tim arrived and we were finally able to check into our room. "See... I am painted above AND below! Rare and wonderful, eh?" Here are all six bridges together, with the Sailors of the Guard for scale. Note how the width of the narrow bridges almost exactly accommodates the stand width (1.75 inches). Hasty Hussars Hussle off to Historicon!